This recently named pretty little aeolid reaches 7 mm in length. 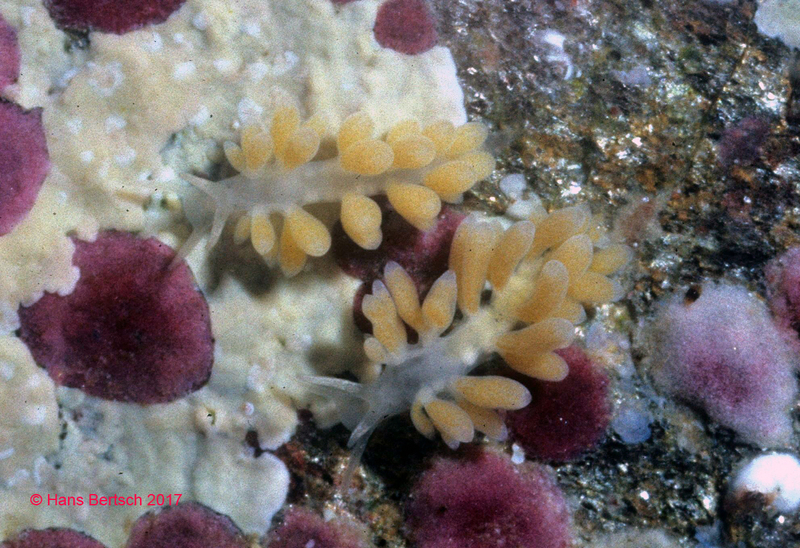 The body is translucent white, and the “over-blown” cerata (short and rounded with an acute apex containing the cnidosac) are whitish to yellow. It has been found rarely from three localities separated by over 3000 km in the eastern Pacific: Punta la Gringa, Bahía de los Ángeles, Baja California, and Majahuitas, Bahía de Banderas, Jalisco, in Mexico, and Punta Arenas, Costa Rica. We follow the taxonomy of Cella et al. 2016, in placing this species in the genus Tenellia. Like so many other nudibranchs, more waits to be discovered about it. Science is really for the children. Yes, it is true: my granddaughter Adriana Ivette Cadena (Photos of Ivette and Tata suiting up at La Gringa) 1 2 3 4 5 has helped me with my research at BLA. Her first visit to the bay was actually a month before she was born. She has since seen the whale sharks, collected a hat-full of clams for dinner and generally explored the natural history of the peninsula anyway she could! (Photos of Ivette with whale sharks) 6 7 8 OK, maybe I’ve linked up a few too many pictures of Ivette’s explorations; hopefully I’ll be excused not only because I’m proud of her, but also because of the importance of environmental education and our duty to teach and share passion, respect and care for earth’s living environments with our children. If we don’t protect it for them, they will lose a part of their lives. As Terry and I wrote in the etymology of Tenellia ivetteae, “She and her brothers and sisters–the children around the world–remind us why we must do science and do it well: to present informed knowledge for informed decisions affecting their future and the life of our planet.” Celebrate and encourage their discoveries. A special thank you to Ricardo Arce, who with his wife Luz María Smith Guerra, owns Ricardo’s Dive Tours, fine purveyors of photographic scuba and snorkeling expeditions in Bahía de los Ángeles, from invertebrates and frogfish,to the renowned whale shark! I’d be remiss without thanking my dear colleague/mentor/collaborator/friend Dr. Terrence Gosliner, together with Bob Vansyoc, and Tony Ferreira hunting for nudibranchs from California to the Gulf of California and beyond since the 1970s. But that’s another grand history! A final note: recently Kevin Lee’s species, Placida kevinleei, was celebrated in BOW 1027. Ivette not only calls him “Uncle Kevin,” they both have slugs named in their honor.